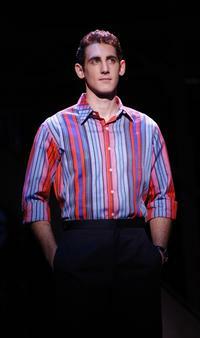 Ryan Jesse will join the Broadway company of Jersey Boys in the role of Bob Gaudio beginning October 12. He replaces Sebastian Arcelus, who as previously reported will be starring in the new Broadway musical Elf, and will play his final performance in Jersey Boys, performing at the August Wilson Theatre, on October 10. As of October 12, the cast will also include Matt Bogart (Nick Massi), Dominic Nolfi (Tommy DeVito), and Jarrod Spector (Frankie Valli), along with Peter Gregus and Mark Lotito, Miles Aubrey, Erik Bates, Bridget Berger, Scott J. Campbell, Kris Coleman, Ken Dow, Russell Fischer, John Hickman, Katie O’Toole, Joe Payne, Jessica Rush, Dominic Scaglione Jr., Sara Schmidt, and Taylor Sternberg. Jesse, who will be making his Broadway debut, comes to the production directly from the Jersey Boys national tour. His previous credits include the international tour of Cinderella, Grey Gardens at Portland Center Stage, and the NYMF production of The Last Starfighter. Jersey Boys August Wilson Theatre Tickets. Save $10 on Jersey Boys Broadway Ticket Orders Over $350! Code AFF$10 — Offer valid few days only.